Elasmosaurus being part of the Plesiosaur group is very much like the Cryptoclidus but only double in size. During the Triassic Era the dinosaurs were typicially much smaller but as the ages went on evolution caught up in the Cretaceous Era and the dinosaurs have gotten much bigger in size. 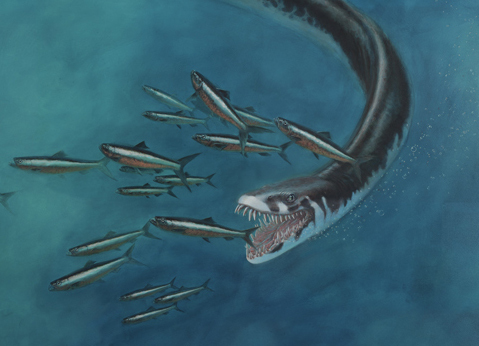 The Elasmosaurus was no different to this fact even though it is not actually a dinosaur. It has 71 vertebrae which is a lot compared to humans with only 7 of them. It appears looking at the fossils that the dinosaur had to have gotten air from the surface like a dolphin. it must’ve swam near the surface in the area of Kansas. That’s were all fossils of this species were found. There isn’t much special features of the Elasmosaurus. It had flippers, was a carnivore, and an extremely long neck but there is a great story of the person who found the first Elasmosaurus. In 1868, Edward Drinker Cope found a full fossil skeleton of the Elasmosaurus. He then put it together but because the neck is over half the size of the rest of the body, he made a funny mistake. He put the head on it’s tail thinking it was a neck, then people pretty much took his word for it until 1870 when someone noticed that it’s kind of weird that the fossil had neck bones for a tail.